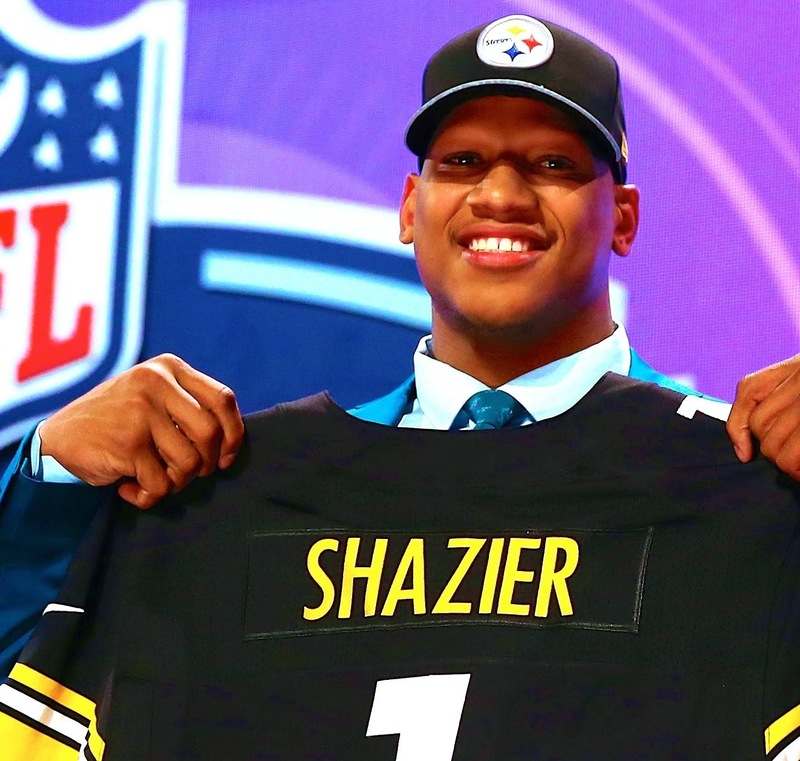 The Steelers' first-round pick in the 2014 draft brought Ryan Shazier to the 'Burgh. Now that the 6'2," 229 pound linebacker from Ohio State has signed a four-year contract with the Black and Gold, Steeler Nation is surely in hopeful anticipation that he'll bring a healthy dose of speed and strength to the D-line. Judging by social media, he's been settling into his new hometown quite nicely, posing for pictures with season ticket holders when he landed at PIT, hitting up Primanti Bros for a snack, and hanging out at PNC Park to watch the Buccos. Coming up with a snack recipe for Shazier was a bit of a head-scratcher. 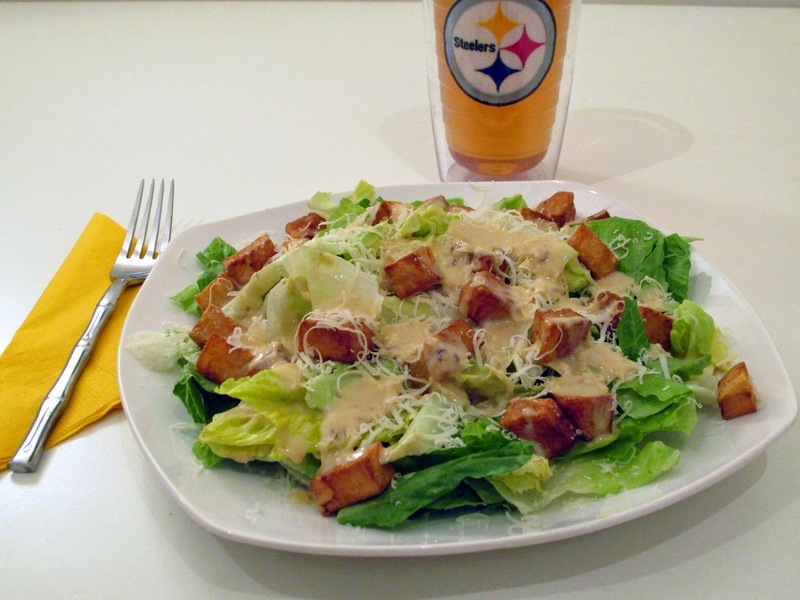 The Creative Director suggested "Shazier Salad," and I thought it would give me an opportunity to try a recipe I've been holding onto for a while now. Salads in western PA are unlike salads anywhere else. Salad = vegetables, dressing, maybe some protein, right? Wrong. 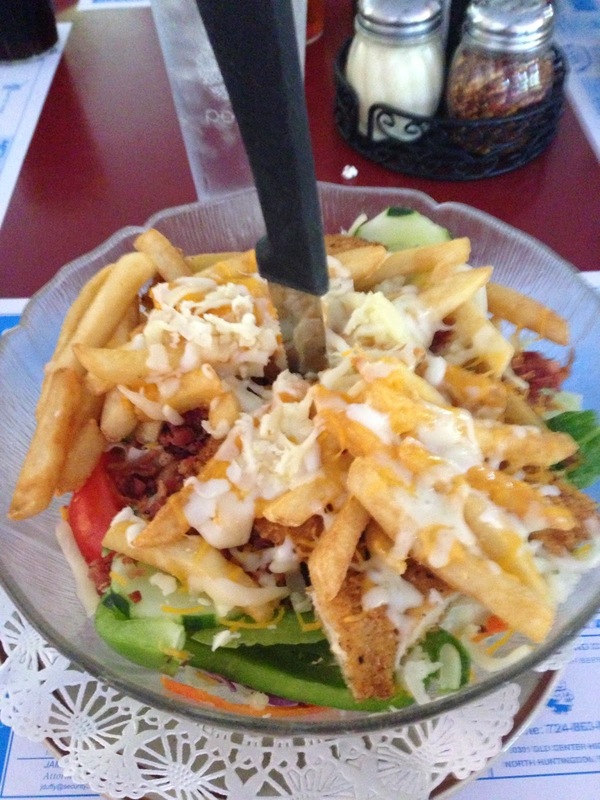 In the 'Burgh, salad comes with lettuce, maybe some tomatoes, carrots, peppers - topped with shredded cheese, french fries, chicken tenders (or steak, depending upon your order), and THEN, the dressing. 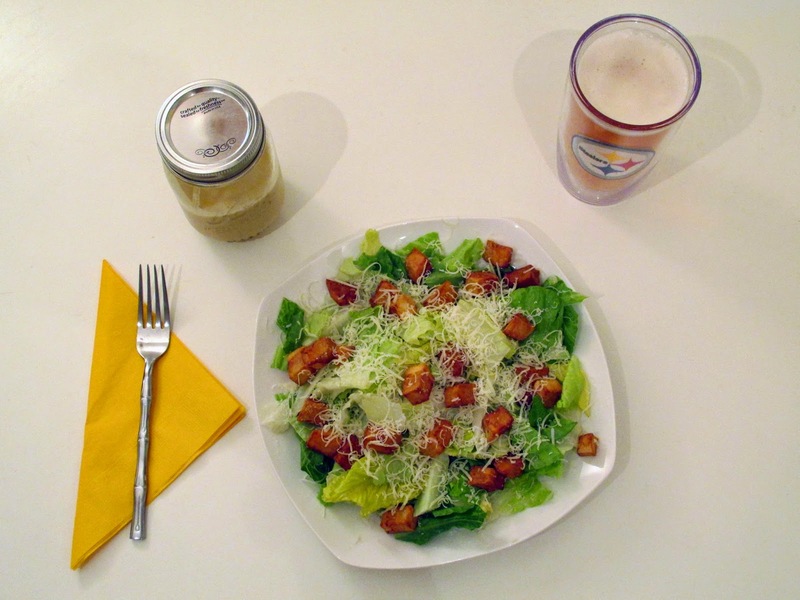 It's kind of like a Happy Meal on a bed of lettuce - and it is so good. Photo credit (above): my brother, Josh, at K-Vays Restaurant in Irwin, PA.
We're skipping the chicken tenders in this recipe, but will be making french fried potato croutons along with from-scratch Caesar (ahem, Shazier) dressing. Make no mistake about it, there is nothing crouton about these... "croutons." They're straight up, deep fried potato cubes - twice fried, just like the Frenchy Fuqua Fries. Essentially, they're home fries, but they're going on a salad, so we're calling them croutons. The Creative Director has an aversion to mayo. I, on the other hand, love all things mayo - potato salad, coleslaw, assorted dips and dressings and what have you. For this dressing, I wanted to spare him another mayonnaise-based concoction that he surely would not touch. Amidst pages of lovely, homemade Caesar dressing recipes, all using heavy helpings of mayo, I found a very authentic recipe from Bon Appétit that uses oil and egg yolks, along with parmesan, garlic, Dijon and lemon juice. Be forewarned, there are raw egg yolks in the recipe. I have no qualms with that and think the end result is a score. Oh! And before I forget, much like the Steelers, we recently signed a new member to our own team - of course, by which I mean, the Creative Director and I adopted a second cat. Meet, The Penguin (the kitten)! I considered "Myron," but decided I'm saving that name for my first-born. The Penguin will get her own Pittsburgh Steelers kitty collar just like her big brother, Batman, as soon as she's big enough to wear one. 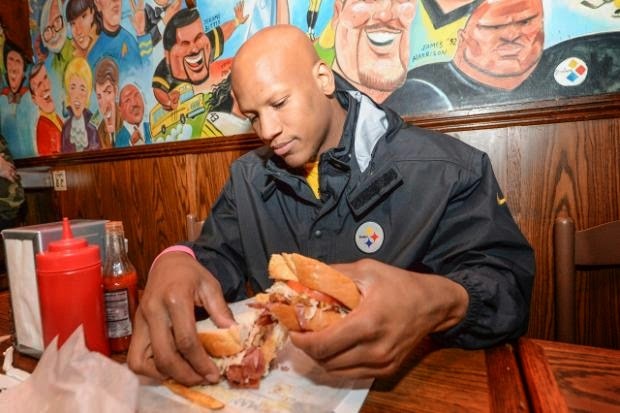 Welcome to Pittsburgh, Ryan Shazier - from here on out, french fries on everything! Prepare the dressing by emptying the anchovy can with oil and garlic clove into food processor. Pulse to blend. (Dressing ingredients can also be whisked together in a large mixing bowl in lieu of a food processor. If whisking, coarsely chop anchovy filets and mash garlic clove into a paste with the flat side of a knife before mixing.) Add egg yolks, lemon juice and dijon, then pulse to combine. Slowly add olive oil while pulsing, then continue to pulse while adding vegetable oil. Run on low-speed for a few seconds to thoroughly combine. Add parmesan, salt and pepper, then pulse for a few seconds more. Refridgerate dressing in an airtight container until ready to serve. 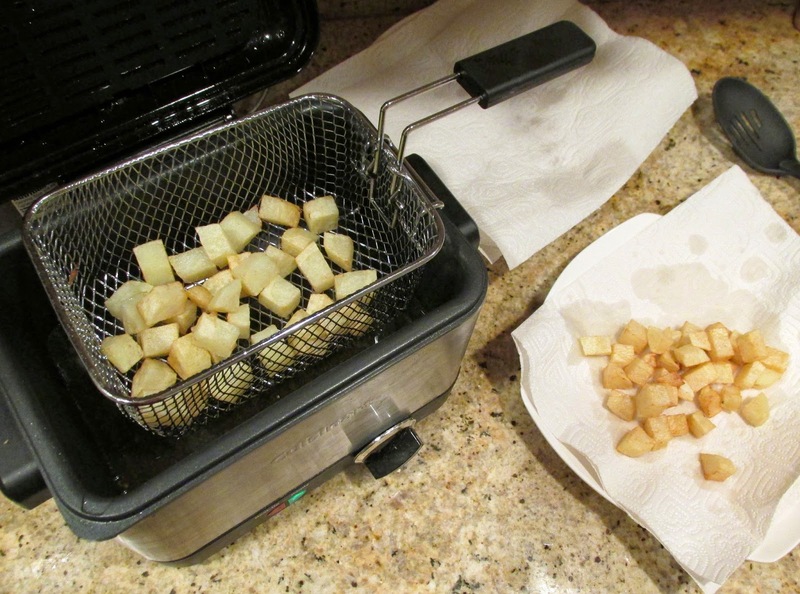 Chop potato into 1/2-3/4 inch cubes, then blanche in cold water for 10 minutes. Heat oil in deep fryer or cast-iron skillet to 325 degrees. Drain potatoes and pat completely dry with paper towels. Fry in two batches for 3 minutes per batch. Raise temperature of oil to 375 degrees. When ready, fry a second time for 4 minutes per batch. Drain on paper towel-line plates and sprinkle with salt. 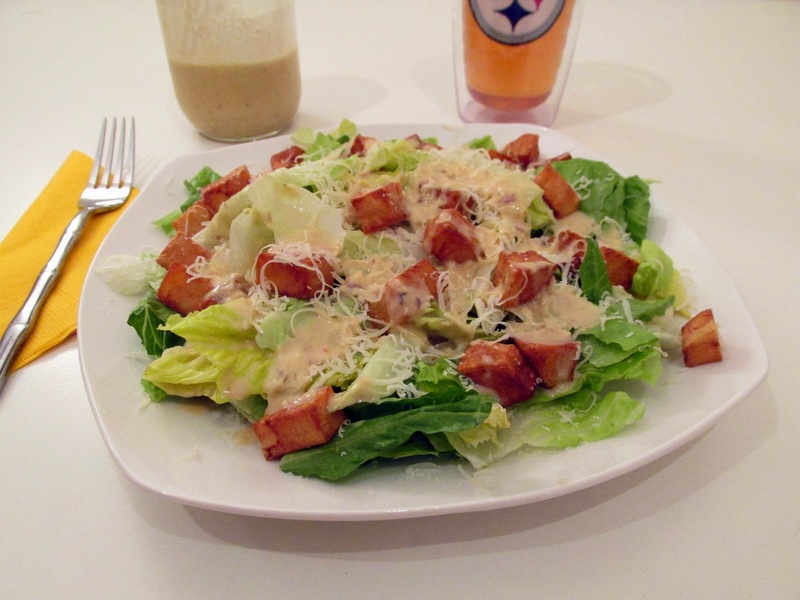 Top lettuce with potatoes, parmesan and dressing and enjoy!